Hi, Skunkboy friends! I'm Jodie, crafter and stitcher of Lova Revolutionary and author of Happy Stitch. Summer time is just my favorite and I love a simple pair of canvas shoes to slip on for some quick outings to the park, to take to the beach, and to play with the pooch in! I picked up a pair recently but decided they needed a little something-something to make them extra cute. I thought I'd share this little restyle DIY with you, so you can stitch up a cute pair or perk up a pair you have already! 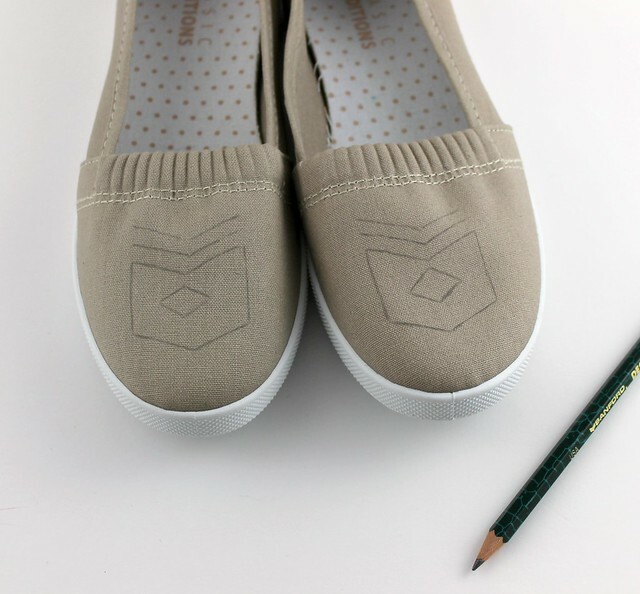 Step 1: Simply sketch out your design on your shoes with a regular pencil, careful to leave some space around the edge. Step 2: Begin filling in your design using some easy embroidery stitches. I used a back stitch for the solid line and a straight stitch along the sides of my shoes. Use a fill stitch to create a solid shape. You may also need a needle gripper-- there are a few different kinds to choose from. Depending on the thickness of your fabric, it may make it easier to pull it through. Step 3: When you are finished with each floss color, tie a knot on the inside to secure your thread. 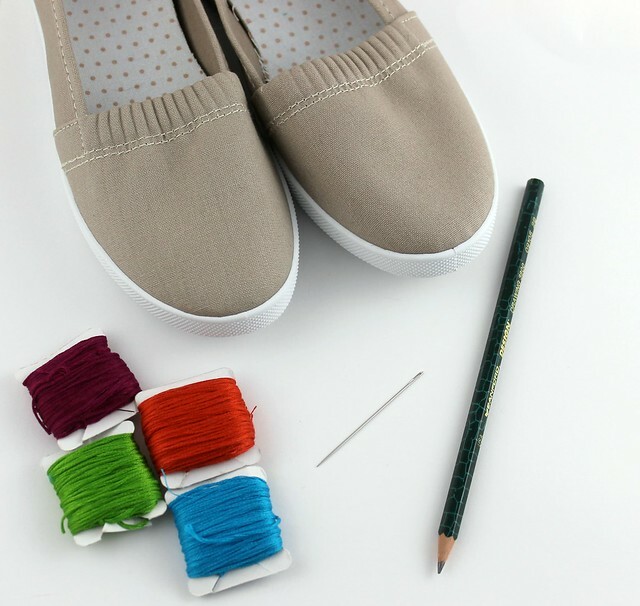 Since it can be a little difficult to make a knot on the inside, try looping your thread around your finger and rolling it down to meet the inside of the top of the shoe. If you need to, use a dab of clear fabric glue on the inside to hold your knot in place. Straight Stitch- bring your thread through the back of your design and then down through the top, leave a small space, and then repeat your stitch. Back Stitch- begin with a single straight stitch. Bring your thread through again from the wrong side of your design, a few centimeters away from where you finished your first stitch. Bring the needle back through the same hole where you ended your first stitch. Fill Stitch- make a series of long straight stitches, very close together to fill your shape. If you have any fabric showing through, just make more long straight stitches on top. You can also outline your shape with a back stitch or small straight stitches. Thanks, Jodie, for this adorable DIY! I can't wait to try it out! 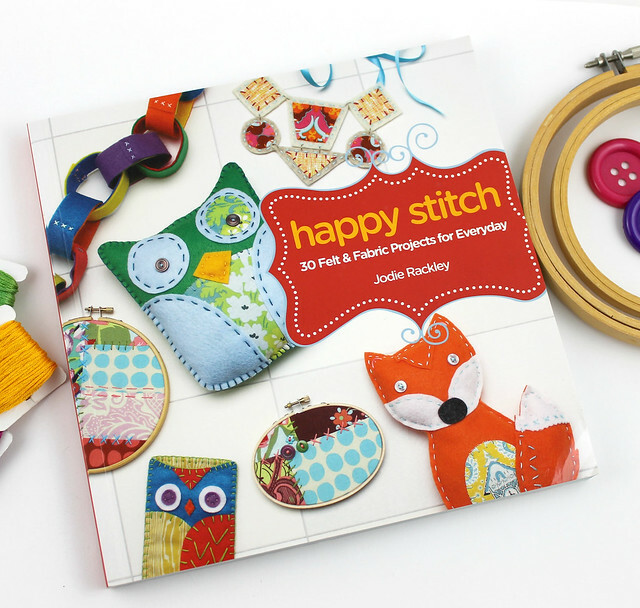 Jodie has also just released her first craft book: Happy Stitch: 30 Felt and Fabric Projects for Everyday, and she is giving two copies away! If you'd like to enter to win a copy of Happy Stitch, just leave a comment saying why you love crafty projects. :) I'll pick the winners at the end of the week! Cute, Cute, Cute! This is such a perfect way to get some cute, cheap and comfy shoes for these hot summer weekends. This is so adorable! I really can't wait to try this! I love those shoes! And if I can craft something, I feel like I did something useful with myself. O.o I'll have to dig up a pair of my canvas shoes to give a facelift! The book has such adorable embroidery patterns and I'm really loving that red fox softie! I love to try crafty projects so I can stretch my creativity. And there is nothing better than being able to say, "I made it." So cute and so simple! I totally want to try this out now! I love crafty people for their unique style! everyone brings their own ideas to a project! What a lovely idea! 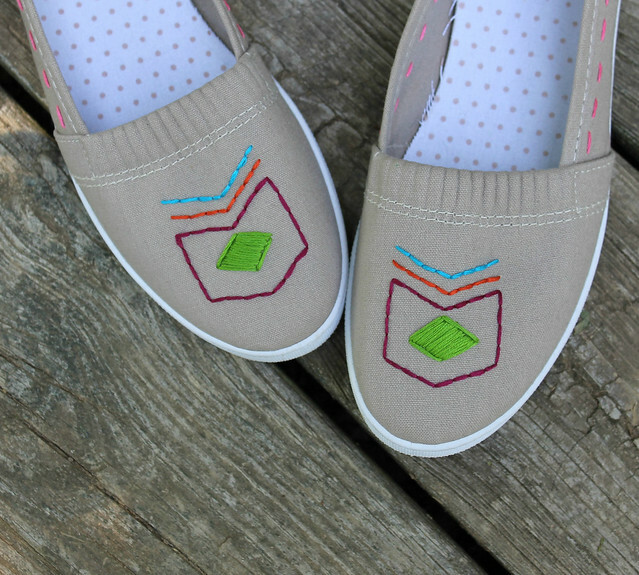 I'm thinking of stitching a bow onto a pair of canvas flats, that would be so cute! Gosh, her book looks adorable. I love crafty projects because I enjoy working with my hands, and I always have feel a great sense of accomplishment when I finish a handmade project! I love crafting because it is a rewarding way to put my creative brain to work! And filling a house with home-made things makes me feel so connected to my surroundings. 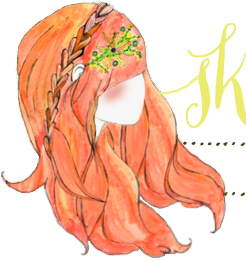 I love the creative outlet that crafting is, and being able to show off something awesome and impress everyone with the fact that it's handmade by moi is always an added bonus! I just started getting into hand stitching - this book would be a great companion! I love crafting because I have gained so many new skills, expanded my creativity and learned to have much more patience! I am especially loving hand stitching because it is both fun and meditative. Ive been sick with a life threatening illness for 6 and a half years, and I love crafting because it gives me an escape like no other. When Ive had a bad day, feeling sick and tired, crafting distracts me from the pain. It helps me to feel useful when I sometimes feel completely useless. Crafty projects make me realize my talents and give me confidence! Adorable project, that book like like it has lots of fun projects. I love craft projects for that accomplished feeling after completing a project! I also love giving craft projects away as gifts because I know the person probably does not have another thing like it! Lately, crafty projects have been a way to nurture my inner introvert. Crafts and projects are the PERFECT opportunity to step back, breathe, and return to the world with the satisfaction of a job (hopefully) well done. I love how the possibilities are endless when it comes to crafts. However, I'm not very good at them but would love to practice with this book! I love teaching my hubbie crafts! He currently is obsessed with 'felties' (basically what that book is) and it's sooooo cute to see his pride when he's finished a little mouse with sunglasses or a fox or little alien! He would go nuts over this step-by-step book! I'm a big fan of crafts because I love personalizing things! what's the point of having something if you can't make it your own? thanks for hosting the giveaway! These shoes are so cute! I'll have to try embroidering a pair for myself. I love crafty projects because you end up with something unique that expresses your personality. I really enjoy the creative process, and I like knowing that no one else has the same thing. I would love to get some new ideas from this book. well, what I love most about creating and being crafty is making perfect presents. I love it, how people's faces light up, when they open a parcel and are absolutely flabbergasted to get something absolutely perfect for them. I love to make people happy like that. Oh I love the embroidered owl on the cover! Crafting keeps my creative self alive! When I haven't crafted in a while I feel 'sluggish'. These cute shoes are definitely on the to-do list! I love crafty projects, well, because I was raised with it! Everyone in my family is always working on something or learning some sort of new skill/ craft. It's how we bond! i love crafty projects because you have take time to be creative and when you finish you feel accomplished! Crafting is one of the few times I get to work with my hands. I love crafting because it gives me a chance to make something original. I love to put my own spin on projects, just so I know they are completely my own. There's also something magical, almost zen like, about being completely wrapped up in a project you're working on. And making something cute ALWAYS makes you happy! i really want this book badly! i love crafting because it brings my imagination to life. and, its super fun! I love creating things that I can say i made. It's just this amazing feeling of making some thing out of anything . I also am looking for new projects and stuff to teach little ones all the time and think they would like to make some of these projects. Super cute! I'm definatly going to have to do this! I love crafting because I love the calming effect of making something and then the wonderful sense of accomplishment when a lovely project is completed. I love creating something that is unique and original and craft projects let you do that! I was knitting a scarf this weekend that I can't wait to wear. I've just gotten into embroidery and this book would be great! I love the shoes! I have taken fabric paint to the same type of shoe and loved the outcome...but THIS is amazing!!! Off to the store. Very cute shoes. I think my step mother would enjoy a pair of embroidered shoes. SO cool. I really love this idea. I haven't embroidered in FOREVER! What a cute idea. That book looks so neat. I would loooovvvee to have it!!! I love it because it's perfect for getting all the stressful stuff out of my head. It's so perfect to use my free time, too. :) this book looks great! I definitely need to try this! I love crafty projects because it's a great creative outlet. And I love making things out of random items! I love crafty projects because it adds a little something extra to everyday items, making them unique and I love it! Just like this DIY! This is just what I need to help get my creative juices flowing for arts and crafts projects with my daughter! Thank you for the chance to win, xoxo, Bea. great tutorial—I can't wait to pick up a pair of shoes and try this out! crafty projects are the best...they are the perfect way to keep your hands busy while watching a movie and relaxing, and I love the added personality of having handmade things to wear or keep around your house. Making crafts gives me such a satisfying feeling. It's relaxing and you always get something cute out of it too! I love crafting becaus eitmakes me happy. That simple. If I don't do a little every day I feel as if a part of me is missing. Thank you for an amazing giveaway. Such a great DIY! I love crafty projects because they are fun and inspiring and help me to express myself. This idea is so great!! I love what you did those shoes! gahhhh i want this book!!! This is awesome! I'd love this book. Crafting is so rewarding. There's nothing better than having someone ask, "Where'd you get that?" and responding with, "I made it!" I craft both because I like making stuff and because I like having made stuff. these shoes are adorbs! I love crafting because it makes me feel alive by both creating something beautiful and by getting to share those beautiful creations with the people I love. There is no better way to tell some someone you love them then by custom crafting something to fit their style! I love the feeling of accomplishment. I love crafty projects because I feel happy doing the crafty projects. I love crafty projects because they take me to my happy place. I don't have a care in the world when I'm creating something. I love craft projects because they allow me to create expensive looking items for cheap. I don't have a lot of money so crafting lets me create those things I want. The shoes are so brilliant..."I love a good refashion"
I would love to have a copy of this book. I love doing craft projects because it keeps my hands busy and my brain active. I work and think and create all at the same time. I keep some craft projects but I am always thinking of new things to create to give as gift to my friends and family! this book looks amazing and so creative! i love crafty project myself because you could be as creative as you want and make up things as you go along. sometimes i start out making something and end up with something completely different than what i imagined but still cute! I love this project. It's so cute!! 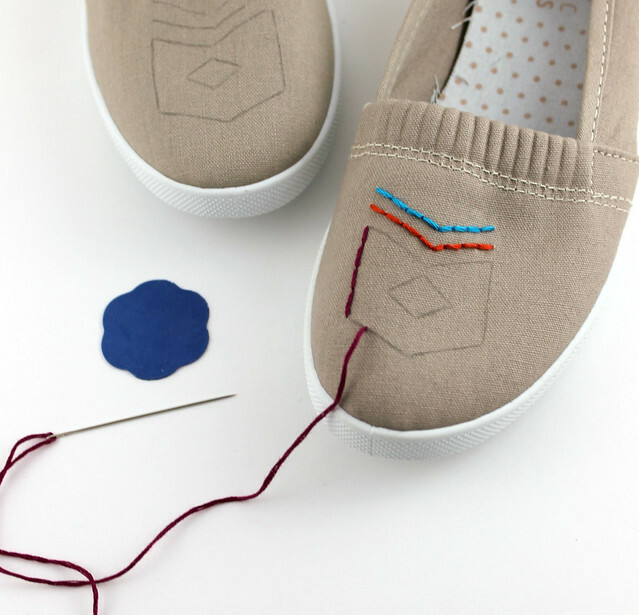 Love this canvas shoes refashion DIY project. Really into it.